Being the long-term owner of a consistently smart and healthy beard is a tricky proposition. A lesser-known secret for the well kept look is beard oils. A good oil will keep the beard soft, shiny, smooth, even and ever the object of admiring attention. But once LB equipped, your beard will soon be strong and spectacular, healthy and epic. Look for quality. Not all oils are equal. The informed beardsman uses only all-natural, pure essential oils. Beard hair is coarse and pure essential oils are more easily absorbed. 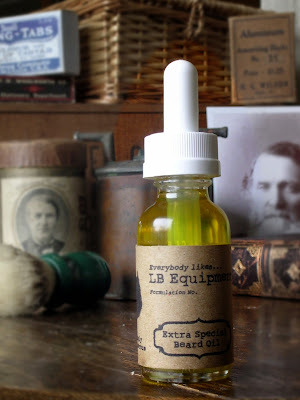 LB currently offers two formulations of premium beard oil, both using nothing but the finest ingredients, and no nonsense. Number 3 is LB's classic original recipe. This beard treatment is made with a special blend of oils including fine Sweet Almond Oil. The Tony is a great place to start if you are looking for something effective and simple to use. This oil offers an alluring, earthy scent with, on closer inspection, a sprightly dash of citrus notes. Number 7 is LB's superior recipe made made with Jojoba Oil, for course hair and the heavier of beards. It offers more rapid absorption for superior conditioning. This oil offers a woody, lush scent with a hint of sweet under notes, reminiscent of long summer perambulations through evergreen forests. Great beards don't take care of themselves. Make restoration, miniaturization and fine oils a part of your daily routine. 1. Shampoo and rinse thoroughly and thoughtfully. 2. A little oil goes a long way. It doesn't take very much to lightly coat your beard and skin. All it takes is 6 to 8 drops massaged or combed into the hair to the skin once a day, and the result is fuller facial hair, worthy of note. 3. After application, groom and style your beard as normal, using a boar bristle brush or comb. 4. Now head out, confident that your beard is ready for whatever your day throws in your path. Make beard oil a part of your daily routine and your beard will soon be admired for its superiority and sophistication. Ingredients: sweet almond oil, jojoba oil, vitamin E oil, essential oils. "Life is too short to be little. Man is never so manly as when he feels deeply, acts boldly, and expresses himself with frankness and with fervor."